This may sound like a crazy way to kick off a clawhammer banjo blog, but in a weird way it seems appropriate to start off with an entry about a three-finger banjo stylist. I say this because I can't think of any musician (with the exception of Doc Watson) who has influenced my music more than Bela Fleck. For those not familiar with Bela, he is a three-finger (bluegrass) banjo player who has effectively taken the instrument into realms that were previously deemed "off limits" to serious banjoists. About 30 years ago, I remember David Grisman stating that he believed Bela Fleck would do more to popularize the banjo than anyone since Earl Scruggs. I also remember thinking that this statement seemed pretty pretentious; turns out that I couldn't have been more wrong... Bela Fleck has now been nominated for more Grammy Awards in different catagories than any other musician in history. It’s clear to me that Bela has played a leading role in the changing way the world views the banjo as it is now considered a “serious” instrument by even the jazz and classical communities, which is something I never thought to see in my lifetime. Bela Fleck’s energy seems unending. Over the years I’ve heard him effectively using the banjo in musical settings ranging from bluegrass to jazz, rock to classical; if there are harder working musicians in this world, I have yet to encounter them. Bela’s unwavering efforts to explore the banjo’s potential is truly inspirational, and it's this (inspiration) that makes him the perfect candidate for this blog; the whole idea behind progressive clawhammer banjo is to take the style into uncharted territory, and that's exactly what Bela's been doing with "bluegrass" banjo for the last thirty years! 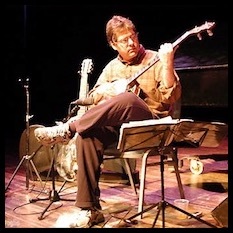 Bela Fleck's example should inspire all banjoists (no matter what style we play) to push the limits of our abilities as we explore new territory on our instruments. It's my wish that all players follow Bela's example by truly listening to those with whom we have the privilege of creating music. I saw this idea executed to perfection when Fleck joined Bruce Hornsby on stage this summer for a rendition of Mandolin Rain. Bela Fleck's minimalist approach to this song was amazing; the man knows how to listen. For more information about Bela Fleck, visit his official website. You can purchase his music almost anyplace that features a wide variety of musical genres. Recommendations: Bela Fleck & The Flecktones, Tales From The Acoustic Planet, and Perpetual Motion.